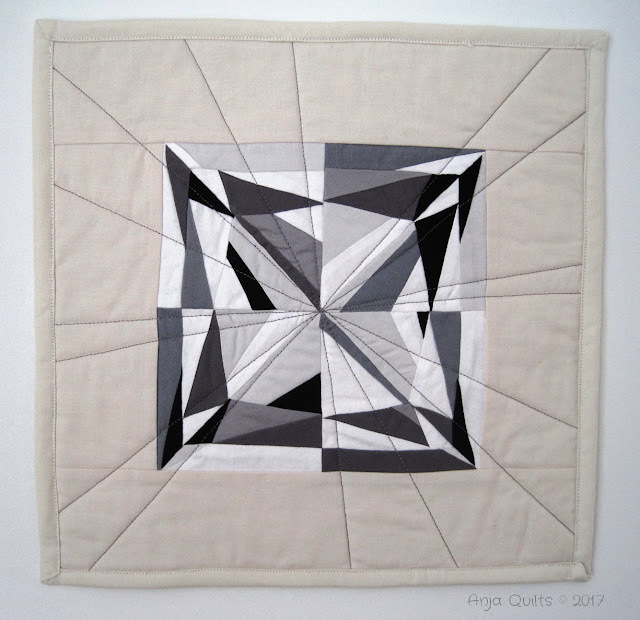 Back in February, I tested some paper piecing patterns for Andrea @ 3rd Story Workshop. There are four patterns in her Gemology Series. 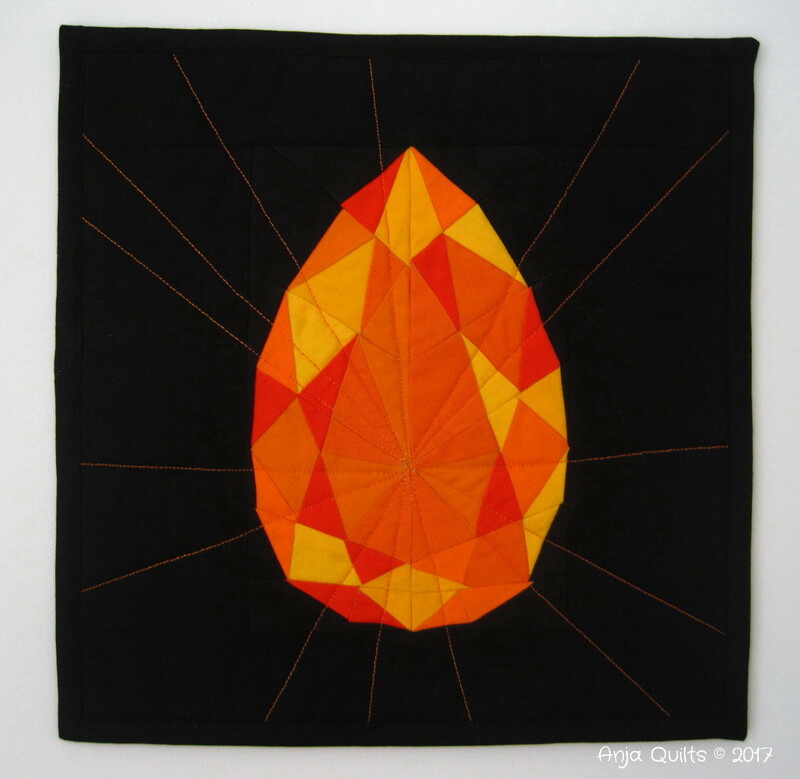 You can find Andrea's patterns here. I procrastinated finishing these wall hangings (about 12 inches) because I didn't know how to quilt them. In the end, I followed the suggestion in the patterns. For the above two, I used Kona Torch, Flame, Sunny, Papaya, Kumquat, Orange, and Black. For these two, I used Kona White, Silver, Iron, Medium Grey, Coal, Black, and Ivory. This is the second of my FAL Q4 goals. I like the orange ones best! Have a great weekend. Superb work! I love the round cut. You are very clever. Wow, they are all so nice! Well done, Anja! I can't pick a favorite! They all look lovely but the orange ones pop! Beautiful finishes! I really, really love the orange ones! 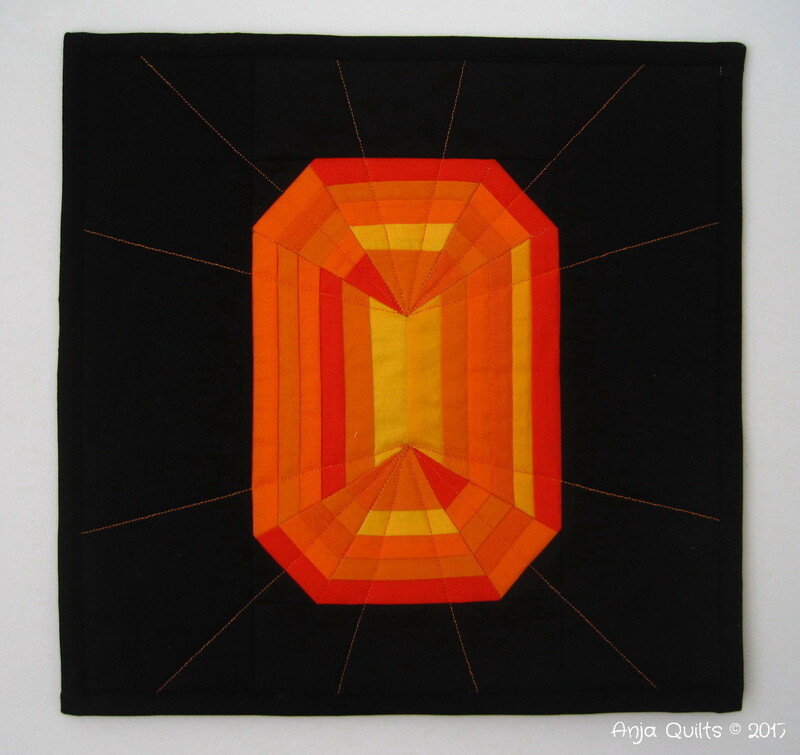 I like the quilting lines radiating out like the gemstones are sparkling. Congratulations on 4 finishes! Very nice designs, I love how the oranges one pop. I love all the unique ideas I see people make out of fabric. 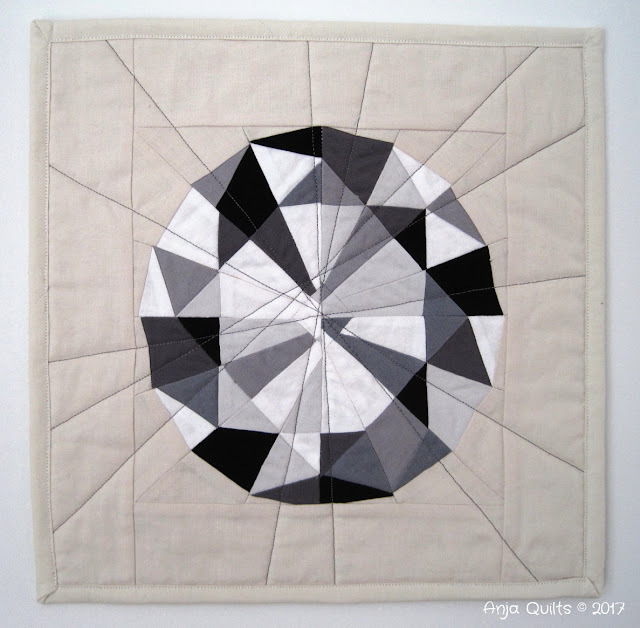 What a great idea for a special quilt for a birthday. Love them all but that Teardrop cut is amazing. I also like the quilting. Looks just like the sun reflections off of a diamond! These are wonderful! Well done! Very nice, I like the teardrop and the round cut best, although I prefer the orange for colour. Wish I could paper piece. These are really pretty. I like the round cut and teardrop best. So many gems and each one is exquisite, Anja. How do you keep them protected? Guards, armored car or a safe deposit box - I am sure they are going to be coveted by many. Terrific job!!! These are beautiful, and your quilting choice is perfect. Thank you for joining in the FAL community on behalf of the global FAL hosts!